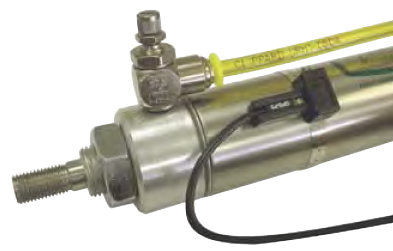 Clippard stainless steel pneumatic cylinders that are equipped with an internal magnet can be used with the Reed Switch and GMR sensor. By accurately sensing the magnetic field of the piston when it passes beneath the sensor, its position is determined, and a feedback signal is created. Clippard's GMR sensor is a solid-state device that is made up of alternating layers of conductive magnetic and non-magnetic materials. When a magnetic field is applied, there is a large drop in resistance. This decrease produces a signal that can be used to determine the location of the piston. Some of the benefits of GMR technology include small size, high durability, high sensitivity, high response time, low power consumption and low cost. These benefits make this sensor a clear choice for piston location in pneumatic system control. Clippard's Reed Switch is a Single Pole, Single Throw (SPST) Normally-Open electronic switch. When the cylinder's magnet-equipped piston moves to a location where the magnet is positioned below the Reed Switch, the Switch sends a feedback single to indicate the location of the piston. This Tech Tip video provides a brief overview of magnetic reed switches and shows how to install one on a pneumatic cylinder.